BUXTON – Buxton’s annual Community Days festival is rounding into shape and includes a fashion show with models displaying how women dressed in a bygone era. The town’s annual shindig combines the two-day Buxton Community Days on Friday, July 18, and Saturday, July 19, with the annual fair and lawn party of the Dorcas Society of Hollis and Buxton on that Saturday. The entire festival happens at historic Tory Hill, intersection of routes 202 and 112, in Buxton. The event featuring food aplenty, fun, entertainment, and fireworks is expected again to attract families from not only Buxton and Hollis, but also from several communities. “We get them from all over,” Pinkham said. The festival gets under way at 5 p.m. on July 18 at Weymouth Park with the opening of booths and amusement rides. Celebration DJ, from 5-8 p.m., features dancing and a sing-along. At 6:30 p.m., fans can root for their favorite team as the Buxton Fire Department takes on their Hollis counterparts in the annual softball game with bragging rights on the line. A full day on Saturday kicks off with the Hollis Lions Club pancake breakfast at 7 a.m. under a tent at Weymouth Park. The road race starts at 8 a.m. The annual parade at 10:30 a.m. includes antique vehicles, monster trucks, race cars, youth groups, churches and local clubs. Floats include the Buxton-Hollis Historical Society and Buxton Garden Club. A throng is expected to pack the parade route along Route 112. Festival demonstrations include those sponsored by Buxton police and fire departments. Pinkham said Buxton police is sponsoring a dunk tank, giving the public an opportunity to dunk their favorite Buxton municipal department head. Last year’s dunk tank raised $150 for Buxton’s Keep the Heat On program, providing assistance for the elderly. The Saturday entertainment lineup includes Saco River Jazz Ensemble at 12:30 p.m.; Bob Costigan, 2:30 p.m.; and Nouveau Rednecks, a Buxton group, at 6 p.m. Activities include horseshoes and pony rides for kids. On the lawn at Tory Hill Church, the Hollis-Buxton Dorcas Society, a charitable group, hosts its annual fair and lawn party from 9 a.m.-3 p.m. on July 19. In connection with the fair, Richard “Sandy” and Beverly Atkinson annually host an open house in the barn at their historic Royal Brewster mansion. A special treat this year will be “Layers of History,” a vintage fashion show at 1 p.m. on a stage in the barn. Lamson said the fashion show includes a narrator explaining garb from the past like corsets. The show is free, but donations will be accepted. Beverly Atkinson said this week she’ll have stuffed animals for door prizes at the barn along with cookies and water. Ice cream cones will be available in the barn for a $1. “I’m hosting this year,” she said. The Dorcas Society, which sponsors a blueberry pie baking contest, serves lunch under a tent on the church lawn. Vendors’ booths will carry a variety of crafts, jewelry and information about local products and services. The Buxton-Hollis Historical Society will staff a booth again at the fair and will have Buxton documentary DVDs and books available. “It’s a very special event,” said Jan Hill, historical society president. Across the road from the church, a Revolutionary War encampment in Helen Bruce Park is always a big attraction with period costumes and cooking demonstrations. Re-enactors fire muskets, and a big cannon is periodically touched off, sending a boom and smoke across the green. Fireworks, sponsored by the Narragansett No. 1 Foundation, cap the festival at 9:30 p.m. 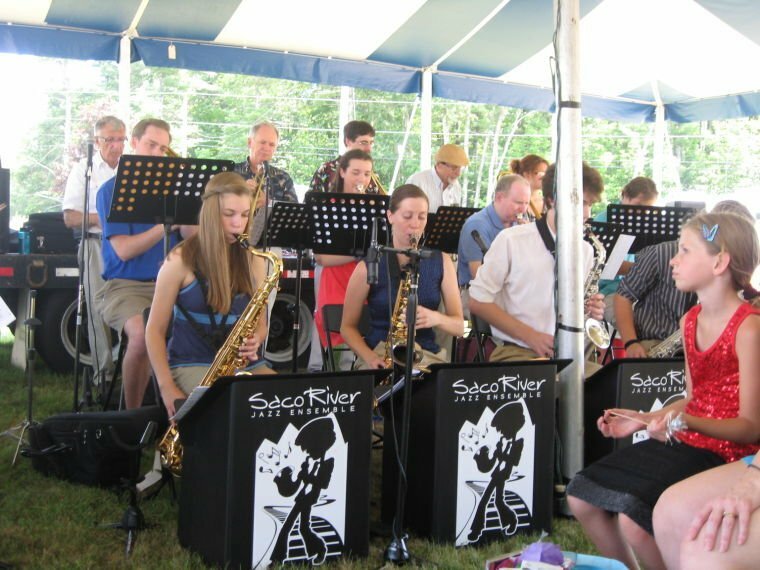 The Saco River Jazz Ensemble returns on Saturday, July 19, to perform at Buxton Community Days.